Wearing glasses comes naturally to many people because they need them to see. However, did you know that not all glasses are safety approved. Why do you have to wear “safety” glasses? Wearing safety glasses can help protect your eyes in certain situations and work places. 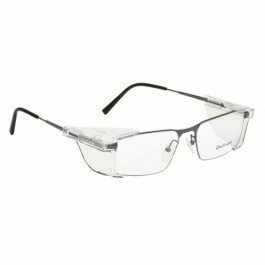 When glasses are safety approved you might see a mark on the frame that reads, “ANSI Z87”. This means that the frame went through intensive testing that ensures they’ll stand up when your eyes need it most. So what are the advantages of prescription safety glasses? Not all safety frames are “ugly” (this being the number one reason most people do not wear safety glasses). Safety glasses that we sell are not only safety approved but they also are fashionable! Check out the OnGuard 125 Prescription Safety Glasses. This frame comes in two color options: Brushed silver and Chocolate Chrome. It also has removable side shields that enable you to wear these on the job or out in the town. This frame is also ANSI Z87 Approved.